That's right! On top of the regular price of the M712, an extra $9.8 gets you a spare magazine, a bag of 4000 rd KSC BBs, and a high quality pistol bag! 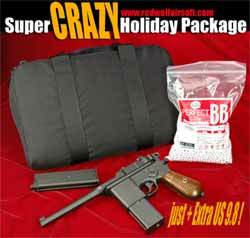 To celebrate this merry holiday season, we are offering a CRAZY deal for our dear customers who love WWII pistols. The HFC M712 itself is worth US$82 and this package price is US$91.8 (everything you see in the picture on the left!) Bought separately, the individual items are worth $142!! Buy this package and save $50.2! The HFC M712 is constructed from solid metal and is very heavy and rigid. Double action trigger allows you shoot as fast as you can. Powerful and accurate performance with full size removeable full metal magazine. Very realistic and highly recommended for collectors. Imitation wood grain plastic broomstick grip with lanyard sling mount ring on handle.